The signs of construction are everywhere at the Front Street Shipyard site on the Belfast waterfront. The company tore down the dilapidated Stinson Seafood plant that formerly occupied the site and plans to build a large facility capable of repairing, retrofitting and building everything from smaller recreational or fishing boats to large yachts. The company could employ as many as 150 people within five years, a representative said Saturday. Downtown Belfast is visible in the background. BELFAST, Maine — Already a well-established stop on coastal Maine’s tourism maps, the city of Belfast is experiencing an economic revival of another sort — as host to a major working waterfront. And if the crowd at a Saturday morning forum is any indication, many residents are embracing Belfast’s dual identity as they await completion of a new shipyard that could draw luxury boats and their well-heeled owners to the midcoast city. 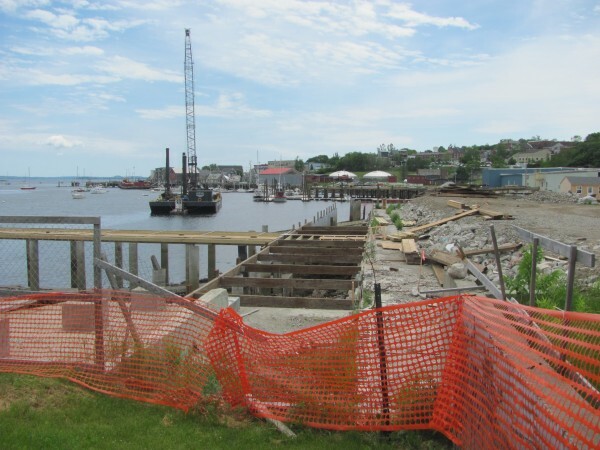 Front Street Shipyard has already demolished the crumbling Stinson Seafood sardine processing plant that had sat abandoned for years not far from Belfast’s harbor and popular downtown waterfront. The company eventually hopes to open a comprehensive boat repair, retrofitting and shipbuilding operation on the five-acre site capable of servicing everything from smaller recreational or fishing vessels to commercial boats and mega-yachts. The proposed complex includes a five-story building where crews could work year-round on boats as well as Maine’s largest “travel lift,” a mechanical hoist capable of lifting ships weighing up to 165 tons. Turner said that because of its size, the reputation of its founders and its location in well-known Penobscot Bay, Front Street Shipyard hopes to compete globally for clients. The yard currently has about a dozen workers but could employ between 100 and 150 within five years, depending on the economy, he said. Audience members had many questions for Turner about a project that many hope will help transform part of Belfast’s waterfront and, in the process, make the coastal town a destination for larger ships. Other panel members talked about the opportunities and challenges the city will face as more ships and people use the harbor. But an economically diverse harbor with a strong working waterfront is a healthy harbor, Messier said. It won’t be just boat traffic, however. Recognizing the heightened tourist interest in shipbuilding and all things nautical, the city is planning a walking trail that will take pedestrians through the shipyard, allowing a close-up look. Fishermen are also planning a new commercial fishing dock. And then there is the traffic that downtown businesses hope to see come through their stores, eateries and bars. Sandra Squire, a transplant to Belfast involved in international boating events and regattas, recounted how people at an event in Antigua were talking to her about Belfast’s new shipyard. The community of mega-sailboat and yacht owners is small and close-knit, Squire said, so word is spreading thanks to the reputation of Turner and others involved in the project. “There is enormous enthusiasm for this project up here, and I think it will benefit all of the businesses in the area,” Squire said. Local lobsterman David Black said Belfast’s working waterfront today — with its diverse businesses ranging from shipbuilding to commercial fishing and aquaculture — is beginning to resemble the way it probably looked a century ago. But with the new shipyard’s capacity for handling larger and higher-end projects, Black predicted Belfast might one day rival Brooklin as the Maine town most closely identified with craft shipbuilding. “Possibly, you’re going to say ‘boat’ and think of Belfast, Maine, because that is where it is all heading,” Black said. Saturday’s event was sponsored by the Belfast Rotary Club and moderated by Belfast town manager Joe Slocum.